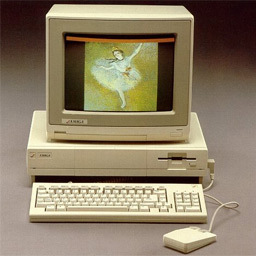 I started learning computer animation using Deluxe Paint on the Commodore Amiga, remember them? Besides giving me a 5-10 year head start on the Windows and Mac people it taught me a lot about making the most out of the fewest resources. Most images on this page are 16 colors or less! 720x486 was like Cinemascope! When it comes to animation, art and life my Amiga also taught me: Plan it all out ahead of time (including Plan B) Less is usually more Infinite resources discourage creativity (remember Heaven's Gate?) Restrictions encourage creativity. This tiny image is actually an entire low resolution Amiga graphics screen. Entire video games were designed for this screen which is now less detailed than a cell phone. This is a still frame from an animation I made as a parody of the "busy screens" you see in the background of sci-fi movies. This is a CGI study I did of the famous painting Isle of the Dead by Arnold B�cklin. This is a still frame from a high resolution animation I did in Deluxepaint of the Union Terminal building in Cincinnati, Ohio. Because it was "high" resolution I could only use sixteen colors but the fountain was animated. Each pixel had to be laid by hand similiar to making a wall mosaic.